No floods, famine, or war. And the people are nice. It’s a Saturday night in August and another electric and endless Arctic sunset has cast the city of Iqaluit in gold. Downtown, on Niaqunngusiariaq Street, in an Inuit-themed bistro featuring tundra-fed musk ox and Arctic char, a host of young urban designers, dance choreographers, and writers, are discussing the plights of their parents, who immigrated to this northernmost province, Nunavut, in eastern Canada, in the 2070s. The smartly dressed friends, enjoying a flowery peach sauvignon blanc from China, are American and Spanish, Indian and African. Compared to their parents and grandparents, who fled deadly heat and droughts, endless forest fires and flash floods, the young artists, in the year 2100, can’t believe they have it so good. 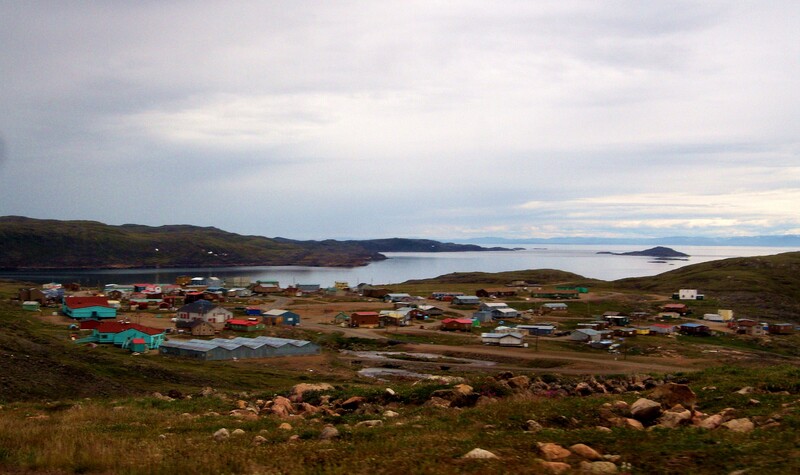 In this perennially growing city, spread out across a series of mountain valleys, with homes that overlook the dynamic color-sweep of Frobisher Bay, they are never short of things to do when they are not at work. Under the eternal summer sun, they hike, bird-watch, kayak (which the Inuit like to remind the newcomers they invented) — the outdoor opportunities are thrilling. That, anyway, is how a travel magazine devoted to the best places to live in 2100 might read. In fact, with the effects of climate change becoming more apparent every day in 2018, it might not be a bad idea to start planning for where our children’s children might live. It’s no surprise that the collective advice of climate scientists today is Go North, Young Man. “If, as many climate models suggest, our planet becomes one of killer heat waves, fickle rain, and baked croplands, might new human societies emerge in places currently unappealing for settlement?” asks Laurence C. Smith, a professor of geography at the University of California, Los Angeles, in his book, The World in 2050 — Four Forces Shaping Civilization’s Northern Future. “Could the 21st century see the decline of the southwestern United States and European Mediterranean, but the ascent of the northern United States, Canada, Scandinavia, and Russia?” According to the latest report from the Intergovernmental Panel on Climate Change, the international body that evaluates the science of climate change, the answer, for the year 2100, is “Yes.” At that time, when Earth’s atmosphere contains 1,000 parts per million of carbon dioxide — highly plausible, scientists say; today it’s 410 ppm — places such as Greenland, Canada, Russia, and the northern United States would be significantly warmer and receive more precipitation than today. They would be downright livable. Based on today’s climate science, here are five of the best places to live in 2100. One of the greatest challenges on a hot planet will be enough fresh water. Higher temperatures, says the IPCC, will “reduce renewable surface water and groundwater resources in most dry subtropical regions.” Greenland has water literally pouring out of its core. A 2016 paper published in the journal Geophysical Research Letters estimates that from January 2011 to December 2014, the Greenland Ice Sheet lost an average of 269 gigatons of ice a year, or about 71 trillion gallons of water. The average American uses about 32,850 gallons a year, which means Greenland’s annual melt can provide water needs for, get ready for it: more than 2 billion Americans. Put another way, a year of Greenland melt means sufficient water for one in three people on the planet. So, Greenland will have water. (Don’t worry, plenty of companies, like National Advisor Bureau Limited, based in the United Arab Emirates, are currently perfecting the technology to tow icebergs to shores and extract the water from them.) There will be water to use for hydroelectric power — five hydroelectric stations already utilize glacial melt in Greenland and the future will see many more. There will be water for heavy industry — Greenland is laden with valuable minerals such as iron, zinc, uranium, and rare-earth elements, and sits astride some of the Arctic’s most massive oil and gas deposits, according to the US Geological Survey. Greenland will have water to drink. Greenland will have water to sell. 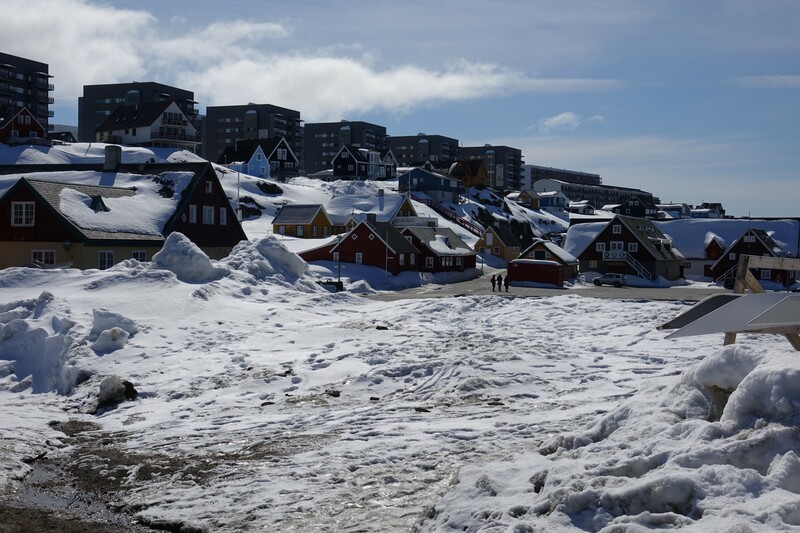 The capital and largest city in Greenland is Nuuk, with 17,000 people, gourmet restaurants, a variety of cultural centers and museums, and famously strong coffee. All of that is overshadowed by the magnificent Sermitsiaq mountains and breaching humpback whales. Warmer weather and more vegetables will surely only enhance Nuuk’s already booming foody scene. The tourism website, ATasteofGreenland.com, is already looking ahead. “Because of climate change the world’s largest island has become even greener,” it states. Just remember to do as the native Inuits do, not as the vanquished Vikings did. Sustainable farming and fishing, yes; perpetual walrus ivory hunting, no. But you can avoid the doom and gloom, and have your weekend farmer’s market, by packing up the Container Store crates and moving to Siberia. Yes, presently, it’s pretty damn cold. Oymyakon, in eastern Siberia, is considered the coldest populated place on earth. The 500-person town is sandwiched between two mountain ranges. The average high temperature in January is -45F. Residents put wool blankets over car engines to keep them warm so they’ll start. But the research of Elena Parfenova and Nadja Tchebakova, of the Siberian Branch of the Russian Academy of Sciences, has shown that by the 2080s, summer temperatures would rise by nine degrees, winter temperatures would rise by 25 degrees, and precipitation would increase. A 2011 paper co-authored by the researchers and a scientist at NASA, published in the journal Environmental Research Letters, stated that from 50 to 85 percent of central Siberia is predicted to be climatically suitable for agriculture by the end of the century. “Crop production could increase twofold,” said the paper. New crops like grapes, corn, peas, and sunflowers would be possible across the territory, and southern Siberia may even become suitable for warmth-loving crops such as melons, gourds, and berries. Parfenova and Tchebakova use an index known as the Ecological Landscape Potential, or ELP, which characterizes conditions for human habitability. 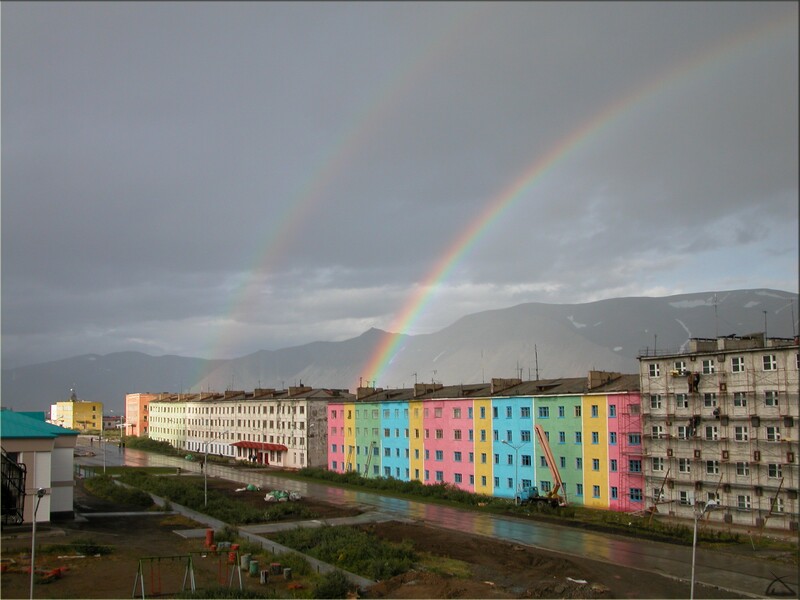 In particular, the ELP in the towns of Egvekinot and Anadyr, have the potential for their population density to increase by more than six-fold. While Parfenova and Tchebakova say the “best place to live” would remain along the Trans-Siberian railroad, where infrastructure is developed, Egvekinot, along Siberia’s Arctic coast, “would likely be a growth point.” Plus, Egvekinot is close to the Bering Strait and future Arctic trade routes, and being perched on the northwestern edge of the vast Pacific Ocean has good access to southeast Asia and the west coast of North America, too. How to put this nicely? On a hot planet, with a paucity of fresh water and food, there will be war. Systems will be down. “Major transportation, command and control, intelligence, and deployment hubs may face unrelenting erratic outages or curtailment of operations,” states a 2016 report by The Center for Climate Security, a DC-based group composed of former Marine, Navy, Army and Coast Guard officers. The United States Environmental Protection Agency has been looking out for us. It’s been tallying a “Climate Resilience Screening Index.” Basically, it’s a color-coded map of the U.S, that conveys, on a county by county level, which areas are best suited to handle climate change. The EPA looked at environmental, economic, and societal aspects of climate resilience, and also assessed governance and social services. The state with by far the highest overall score is Maine. With rocky coasts that would be difficult to attack and easy to defend, close enough to the ocean for trade and transport, but high and rocky enough to not lose all of their coastline to storms and sea level rise, Maine could be the place for peace. It could also, in fact, be further fortified. In 2016, the Union of Concerned Scientists reported that a three-foot rise in sea levels would threaten 128 coastal defense installations in the U.S., many located in the South and Mid-Atlantic. As the world moves north to escape the heat, and the melting Arctic opens up major shipping routes, Maine could well become a strategically important military outpost. The military has long been betting on Alaska to play a more strategic role in an Arctic-busy world, but recently Maine has become part of that conversation too. 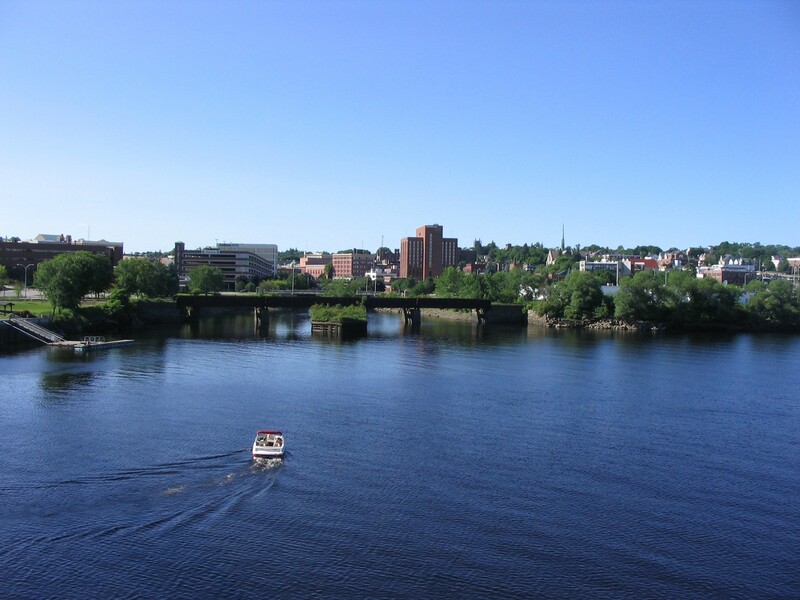 Just now in Maine, Portland typically tops the list of best cities with “great restaurants, scenery, and schools,” writes Marina Schauffler of the Portland Press Herald. However, she notes, “The city’s bustling Old Port, much of it built on fill, is highly vulnerable to sea-level rise and storm surge” and “parts of the gateway Bayside neighborhood are even lower in elevation than the Maine State Pier along Portland’s waterfront.” Sea level rise won’t help any of this. So why not go even further north, to Bangor. The former timber hub is surrounded by forests, trails, parks, and breweries. And as the sea comes creeping up the Penobscot River, settlers can just keep on creeping further upstream. For a city to be able to take in potentially millions of new climate refugees it needs space. Meaning a metropolis laid out across relatively flat, relatively stable, grid-connected, non-flood prone land that has been developed but not too developed and still a natural enough landscape to be pleasant. So where is there a city that has this — and also will have water, nearby farmland, and not be close enough to the ocean to be swamped by rising seas or superstorms? Buffalo, says Jesse Keenan, a faculty member of Harvard University’s Graduate School of Design. Keenan has studied the impact of climate change on cities around the world, notably Copenhagen, Hong Kong, and Miami. He coined the term “climate gentrification,” based on his research showing that costs associated with climate change — such as rising home prices on higher elevations in coastal areas — are beginning to drive people from their longtime neighborhoods and homes. He says he’s often asked by international investors where he would move in the future, and Buffalo is his regular answer. “You first want to go where there’s fresh water and moderate temperatures,” Keenan says. “The Great Lakes for me make a lot of sense. Now, there’re algal blooms in the Great Lakes, and those aren’t easy problems to solve, but if you’ve got your algal loads under control and you manage that appropriately, Buffalo’s going to be an area that I think we’ll see a renewed economic investment because of its long-term capacity to accommodate density.” Many Great Lake cities fit a similar mold: Duluth, Chicago, Cleveland. “Anywhere in the Great Lakes should be OK,” says Keenan. One of the most underrated losses to people fleeing their drowning or burning cities will be arts and culture. Both will be essential to help humanity deal with the inevitable pain of a 1,000 ppm future. Throughout history, cultural meccas have moved around the world, and although this might sound far-fetched, as most of us have never heard of Iqaluit, the northern Canadian town, population 7,000, is already showing signs of a burgeoning arts and culture scene. There are artists, bureaucrats, and hardworking new arrivals. A 2011 article in the Nunatsiaq News, the Canadian Arctic’s main newspaper, profiled the story of 26-year-old Serge Lampron, who moved to Iqaluit from a smaller community “to make it big as a hip-hop artist.” Nearby Cape Dorset, famous for its soapstone carvings, has been said to have more artists per capita than any other city in Canada. Iqaluit is well positioned to take advantage of a climate change-inspired push north. The city began as an America cold war airbase in the 1950s and ’60s, meant to track Soviet nuclear missiles headed across the Pole for America. Just last year Iqaluit opened a brand new international airport, and the city is located snug at the end of a long bay, making it better protected from notorious Arctic storms that have eaten away shorelines in places like Alaska. The city is presently above the tree line and soils are poor. But some 60 million years ago, at the start of the Cenozoic era, which scientists have called “a greenhouse world,” vast temperate rainforest, similar to the coastal rainforests of the Pacific Northwest and Chile, existed across the Arctic Archipelago. That greenhouse world could come again. A 2003 paper in the research journal Paleobiology tells us that the Arctic climate “supported productive, high-biomass redwood-dominated forests.” So come party in the forests of Iqaluit! And don’t forget your guitars, paints, books, and Happy Light lamps. In the winter, sunrise is at 9:20 in the morning and sunset at 1:40 in the afternoon. Magazine writer on issues of science and environment with Rolling Stone, Popular Mechanics, Nautilus, Tin House, Oxford American, Virginia Quarterly Review.